Non-fiction – memoir; paperback; Finch Publishing; 217 pages; 2018. 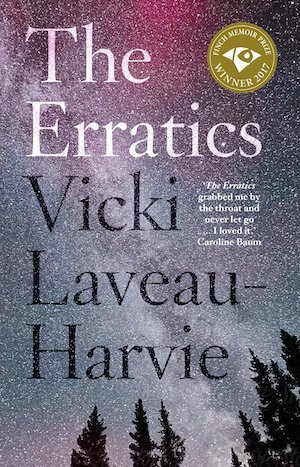 Vicki Laveau-Harvie is a retired academic and translator whose memoir The Erratics won the 2018 Finch Memoir Prize. Last month the book was longlisted for the 2019 Stella Prize. It’s a compelling account of dealing with elderly parents — one of whom is trying to kill the other — from afar. Imagine, if you will, the following scenario. You grew up in Canada, on a big sprawling isolated property on the prairies of Alberta, with a younger sister, and a mother who had a vibrant, mercurial, some might say challenging, personality and an easy-going, hen-pecked father. You now live in Sydney, Australia, where you have raised a family of your own. You have been estranged from your parents for a long time. In fact, they have disinherited both you and your sister, and your mother goes around telling everyone that she only has one daughter and that she died many years ago. Or sometimes she says that her two daughters disappeared decades ago and despite hiring investigators on several continents they have never been found. Then you get a call to say your mother has been hospitalised unexpectedly. She has broken a hip. When you fly to the other side of the world to visit her, you discover she’s as cantankerous and difficult as ever. But you are shocked to see that your father is all skin and bones. You think he might have a terminal disease. Then it slowly dawns on you that your mother has been starving him deliberately and that he has a severe case of Stockholm Syndrome. It is a disturbing and frightening realisation. What do you do? You (and your sister) do whatever you can to ensure your mother is kept in hospital for as long as possible so that you can plan your father’s “escape” — the last thing you want is your mother returning home to continue her abusive treatment, for he will die at her hand. But how do you convince the authorities that your mother is crazy and hellbent on killing her husband when she’s got such a forceful personality and a long track record of telling lies? How do you get them to understand that you have your father’s interests at heart and not your own? That is essentially the scope of this gripping memoir, one that I read in one, long compulsive sitting, unable to tear my eyes from the page. Laveau-Harvie writes in an easy-going style that feels light as air despite dealing with dark and troubling issues and emotions. There’s no self-pity. Instead, there’s lots of honesty, pragmatism and self-deprecating (often sarcastic) humour. It’s heartbreaking and frightening by turn. Occasionally, it almost feels like a story that American TV producer and comedy writer Larry “Curb Your Enthusiasm” David might have come up with, it really is that funny and the family so dysfunctional. But underpinning the narrative is a quiet strength and an almost ruthless quest to sort things out even if it means revisiting the horrors of the past. 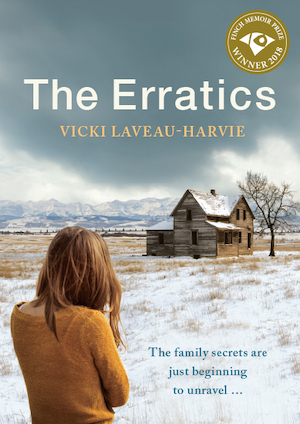 The Erratics is a brave and sometimes harrowing book, one that deserves a wide audience, but it’s also a testament to family love and the ties that bind. UPDATE: Kate, who blogs at Books are my Favourite and Best, has also reviewed this book. She has a slightly different take on it to me. This is my my 1st book for the 2019 Stella Prize shortlist and my 2nd book for #AWW2019. It took some effort to track it down in Western Australia, where I spent two weeks last month. It hasn’t been published outside of Australia so, sadly, it will be even harder to source if you live in the Northern Hemisphere. The publisher ceased trading at the end of 2018, but I believe the book has since been picked up by 4th Estate in Australia where it will be republished in mid-March. To purchase a copy outside of Australia, your best bet would be to place an order with Readings.com.au — sadly, it won’t be a cheap exercise. Well, it sounds completely compelling and I can understand why you couldn’t put it down. It’s scary what human beings can put other human beings through. It’s an amazing portrait of a dysfunctional family. I’d love to know more about the mother and what she was like when she was younger and what turned her into such a difficult person: was she always like this or did she grow into it? I was also gripped by this book but got a very different impression of the author and her circumstances – I do love it when other readers see something completely different to what I have. My review will be up within the next few days but in short, I struggled with her ‘opting out’ and leaving her sister to bear the load (for example when they cleared out the house and the sister’s friends did all of the work…and then the author complained that the china she asked for broke in transit). As I will say in my own review, I suspect this story is all a little close to home for me! I agree that there is no self-pity, which is remarkable. I wondered though, if the circumstances of her childhood had been so traumatic that she hadn’t quite dealt with the pain associated with that – a mother’s rejection leaves deep scars. You’ll note I’m reviewing the book and not the author. I loved her story, but that doesn’t mean I agreed with the decisions she made. I actually think most of the things she did (or failed to do) were probably acts of self preservation; she provides so little detail of what happened during her childhood but I can only imagine she still hasn’t fully processed it, hence her moving to the other side of the world and being rather hands off with the household clearout etc. I think the book is all the braver because the portrait of herself doesn’t seem to have been prettied up: she could have easily portrayed herself in a much more positive light aka dutiful daughter. Will look forward to your review! Yes, I agree that there is a large amount of self-preservation at work and I’m not sure that she has even come close to processing it (although she mentions her own children and grandchildren, so I wonder what her experience of parenting has been like). I’ll have to think further about the intersect in memoir between the book and the author.. I read a lot of memoirs because it gives you a glimpse of others, but of course only what they are prepared to ‘show the world’ – so do we not judge what they are showing the world…? I keep coming back to something Catherine Deveny said at the last Melbourne Writers Festival about memoir – “…it doesn’t have to be accurate, but it does have to be authentic.” In that sense, this book ticks all the boxes. I’ll link back to your review so that others can join this thread! Thanks, Kate. I love memoirs and read quite a lot of them too. Not reviewing the author is one of the things I learnt in my early days working in magazines… there was a very famous libel case in our company regarding a product review of a yacht in a boating magazine that slagged off the business that made the yacht rather than reviewing the yacht. That has always stuck with me. (The libel damages were somewhere in the region of £1.5m!!) so my mantra is review the work not the person who created the work! But you’re right; it can be hard to do that with memoirs which are almost one and the same thing. This sounds like an appalling situation, not one I want to read about! Ha! It was an intriguing read to see how two siblings could react so differently to the same situation. Plus, there’s lots here we don’t know about (such as their childhoods), but it just didn’t matter because she writes to beautifully and isn’t afraid to use black humour. Ah yes, my favourite Shakespeare play! I actually wondered if you might have read this one, Sue. I read quite a lot of memoirs (see here: https://readingmattersblog.com/category/non-fiction/memoir-non-fiction/ ) but this one is quite unlike anything I’ve read before. Obviously, because it’s told from one point of view there’s lots of unanswered questions, but I found she wrote so wonderfully it hardly mattered: I got swept up entirely by the story. Fair “wonder” kimbofo, but no. I like a good memoir, but don’t read as many as I know I’d enjoy. It’s really interesting to read yours and Kates reviews of this. It would be great to hear what Harvie’s sister’s perspective is – I sometimes think siblings have very different upbringings, even in the same house with the same parents! Yes, I’d love to know the sister’s point of view… I think it would be quite different. But I’d REALLY like to hear from the mother… she seems so monstrous but I wonder how she rationalises things in her mind. It was fascinating to compare your reaction with Kate’s. I know she had some reservations about this book but it does sound immensely powerful. Dealing with aging parents is difficult enough (my parents are both fortunately still in reasonable health but its so sad to see the deterioration in their mobility) but the particular circumstances made it many times more challenging.